Pinometostat (EPZ5676) is an S-adenosyl methionine (SAM) competitive inhibitor of protein methyltransferase DOT1L with Ki of 80 pM in a cell-free assay, demonstrating >37,000-fold selectivity against all other PMTs tested, inhibits H3K79 methylation in tumor. Phase 1. Treatment of c-Kit+ bone marrow (BM) cells from Setd2f/f/Vav1-Cre mice with JQ1 500nM, EPZ-5676 1uM, BAY 1143572 400 nM for 24 h. Then cells were collected to determine the proteins levels of RNA pol II (Ser2P), pol II (Ser5P), Gata1, Gata3, Myc, and β-actin by immunoblotting. Haematologica, 2018, 103(7):1110-1123. Pinometostat (EPZ5676) purchased from Selleck. (A) HOXA9, PBX3, cleaved caspase 3 and cleaved PARP expression levels in OCI-AML2 and OCI-AML3 cells treated with EPZ5676 (10 µM) and harvested on the indicated day. Three independent western blotting replicates were performed. Theranostics, 2018, 8(16):4359-4371. Pinometostat (EPZ5676) purchased from Selleck. Western blot validation of H3K79me2 depletion in Jurkat cells. Mixtures of 0%–100% EPZ5676-treated cells (0:100; 25:75; 50:50, 75:25; 100:0 proportions of [DMSO-treated:EPZ5676-treated] cells) were measured by immunoblot (IB) for the presence of H3K79me2, H3K4me3, or total histone H3 (loading control). Treated cells were exposed to 20 μM EPZ5676 for 4 days. Cell Rep, 2014, 9(3): 1163-70 . Pinometostat (EPZ5676) purchased from Selleck. Cell Mol Immunol, 2018, doi: 10.1038/s41423-018-0170-4. Pinometostat (EPZ5676) purchased from Selleck. EPZ-5676 reduces H3K79 dimethylation with a cellular IC50 of 2.6 nM in MV4-11 cells. EPZ-5676 treatment results in concentration- and time-dependent reduction of H3K79 methylation without effect on the methylation status of other histone sites, which leads to inhibition of key MLL target genes and selective, apoptotic cell killing in MLL-rearranged leukemia cells. EPZ-5676 inhibits proliferation of MLL-AF4 rearranged cell line MV4-11 with an IC50 of 9 nM. EPZ-5676 continuously intravenous infusion for 21 days to xenograft model of MLL-rearranged leukemia, leads to dose-dependent anti-tumor activity. At the highest dose of 70.5 mg/kg/day, complete tumor regressions are achieved with no regrowth for up to 32 days after the cessation of treatment. No significant weight loss or obvious toxicity is observed in rats treated with EPZ-5676 during efficacy study. Robert A. 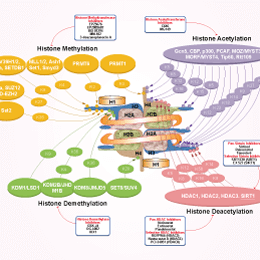 Protein methyltransferases in cancer. AACR Annual Meeting, 2013. Is the vehicle 30% PEG400/0.5% Tween80/5% propylene glycol recommended for in vivo use? S7062 EPZ-5676 in 30% PEG400/0.5% Tween80/5% propylene glycol at 30 mg/ml is a suspension. For injection, 2% DMSO/30% PEG 300/5% Tween 80/ddH2O at 5 mg/ml is suitable. SGC 0946 : DOT1L, IC50=0.3 nM. Entacapone : Approved by FDA for Parkinson's disease. EPZ004777 New : Potent, selective DOT1L inhibitor with IC50 of 0.4 nM. 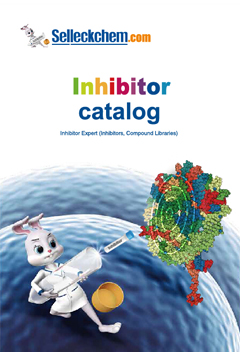 UNC1999 New : Potent, orally bioavailable and selective inhibitor of EZH2 and EZH1 with IC50 of 2 nM and 45 nM, respectively, showing >1000-fold selectivity over a broad range of epigenetic and non-epigenetic targets.